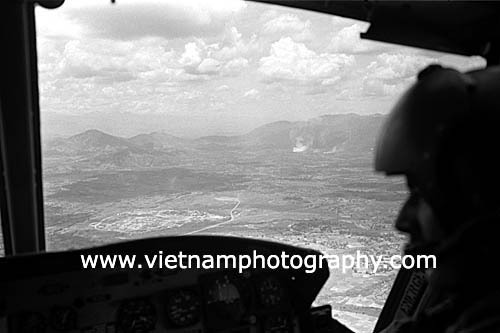 Troopers from the Americal Division make an air assault into the central highlands of Vietnam. 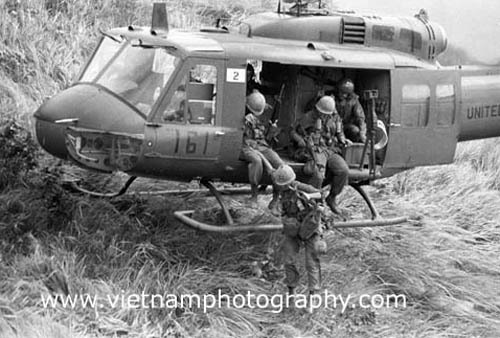 They flew in UH-1 Hueys from the 161st Assault Helicopter Company. 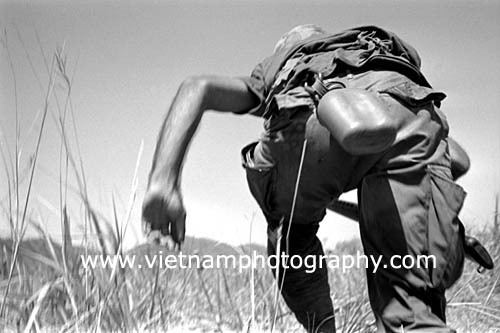 An unidentified soldier from Bravo Co., 4th Battalion, 31st Infantry Regiment, Americal Division, runs toward enemy positions during a firefight in the Hiep Duc Valley, 35 miles south of Danang. The valley was the site of some of the fiercest fighting of the war between Americans and North Vietnamese Army (NVA) regulars. 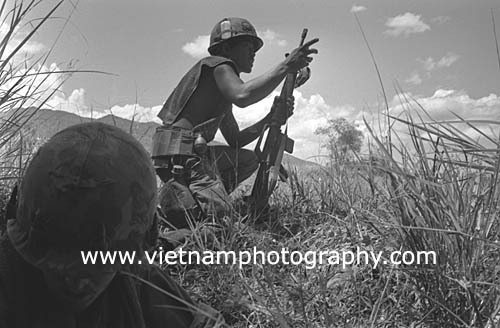 Soldiers from Bravo Co., 4th Battalion, 31st Infantry Regiment, Americal Division, scramble for cover during a firefight in the Hiep Duc Valley, 35 miles south of Danang. The valley was the site of some of the fiercest fighting of the war between Americans and North Vietnamese Army (NVA) regulars. Pfc. 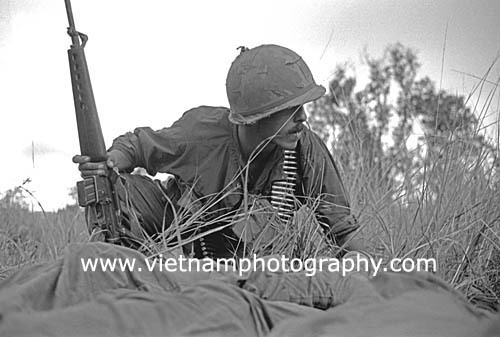 Garry Hodges, 18, of Kansas City, Mo., takes cover during a firefight in the Hiep Duc Valley. Hodges was with Bravo Co., 4th Battalion, 31st Infantry Regiment, 196th Light Infantry Brigade, Americal Division. The Hiep Duc Valley, 35 miles south of Danang, was the site of some of the fiercest fighting of the war between Americans and North Vietnamese Army (NVA) regulars. 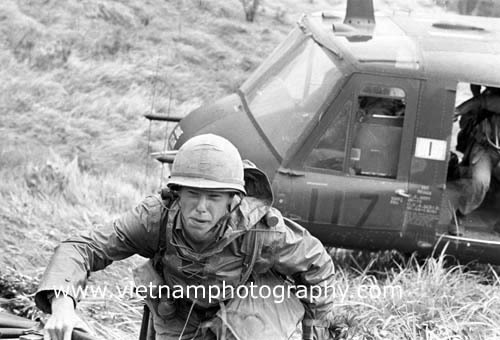 Troopers from the Americal Division make an air assault in the central highlands of Vietnam. They flew in UH-1 Hueys from the 117th Assault Helicopter Company. Pfc. 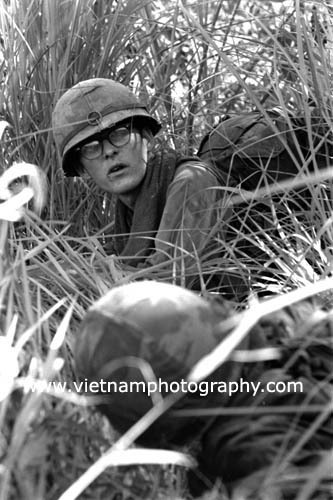 Blair G. (Joe) Furman, 21, of Edmonds, Wash., Bravo Co., 4th Battalion, 31st Infantry Regiment, Americal Division, ducks for cover as a firefight breaks out in the Hiep Duc Valley, 35 miles south of Danang. 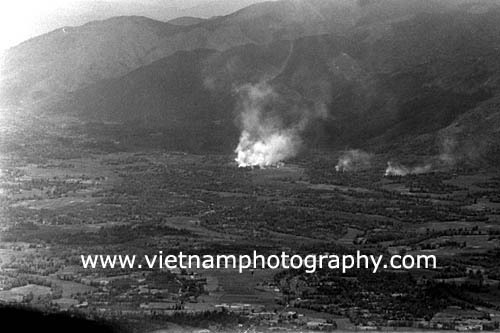 The valley was the site of some of the fiercest fighting of the war between Americans and North Vietnamese Army (NVA) regulars. 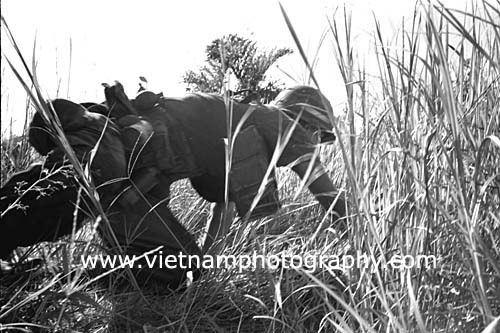 The battle in the Hiep Duc Valley, 35 miles south of Danang, was one of the bloodiest of 1969. When it was over, more than 400 Americans were wounded and 80 were dead. The American military said more than 1,000 NVA died. 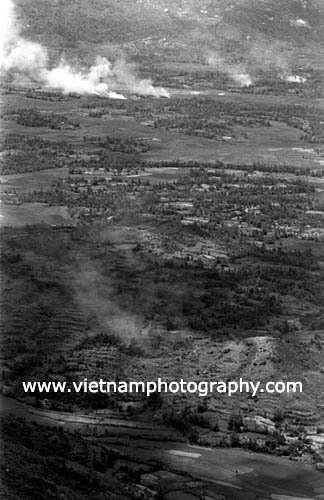 This aerial shot was taken during the height of the battle. Capt. 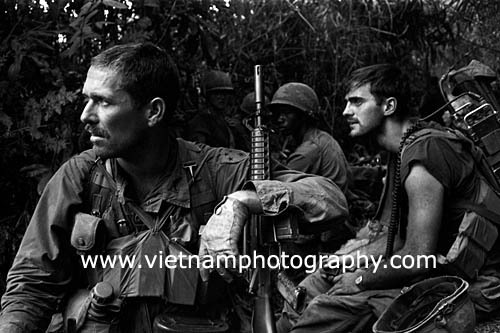 William H. Gaylor, commander of Bravo Co., 4th Battalion, 31st Infantry Regiment, Americal Division, (left)prepares to lead his men into the Hiep Duc Valley, 35 miles south of Danang. His company had already been into the valley that morning and lost one man killed (KIA) and 13 wounded (WIA). Temperatures were well over 100 degrees. On the right is radio operator Spec. 4 James Sebestyen, 22, of the Bronx, N.Y.
Capt. 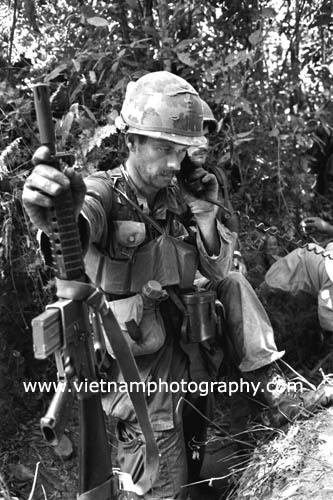 William H. Gaylor, commander of Bravo Co., 4th Battalion, 31st Infantry Regiment, Americal Division, prepares to lead his men into the Hiep Duc Valley, 35 miles south of Danang. His company had already been into the valley that morning and lost one man killed (KIA) and 13 wounded (WIA). Temperatures were well over 100 degrees. 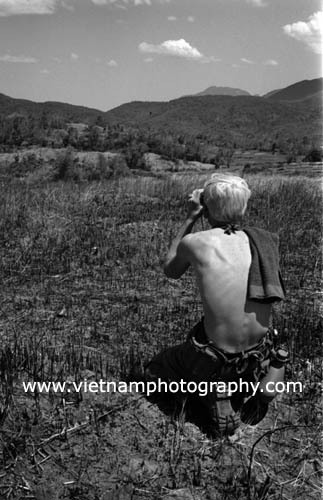 An unidentified soldier from Bravo Co., 4th Battalion, 31st Infantry Regiment, Americal Division, peers through binoculars into the Hiep Duc Valley, 35 miles south of Danang. The valley was the site of some of the fiercest fighting of the war between Americans and North Vietnamese Army (NVA) regulars. 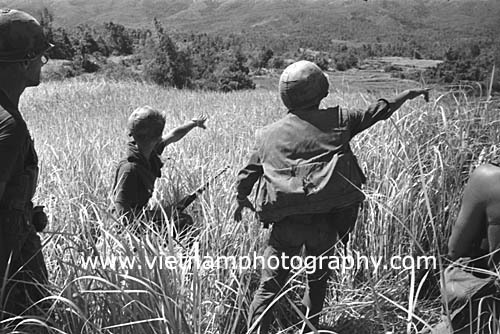 Soldiers from Bravo Co., 4th Battalion, 31st Infantry Regiment, Americal Division, point to the area they are about to assault in the Hiep Duc Valley, 35 miles south of Danang. The valley was the site of some of the fiercest fighting of the war between Americans and North Vietnamese Army (NVA) regulars. 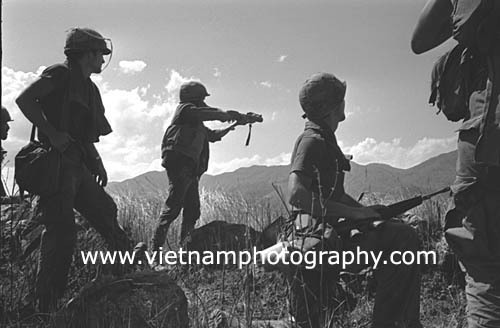 Soldiers from Bravo Co., 4th Battalion, 31st Infantry Regiment, Americal Division, fire an M-79 grenade launcher into an area they are about to assault in the Hiep Duc Valley, 35 miles south of Danang. The valley was the site of some of the fiercest fighting of the war between Americans and North Vietnamese Army (NVA) regulars.